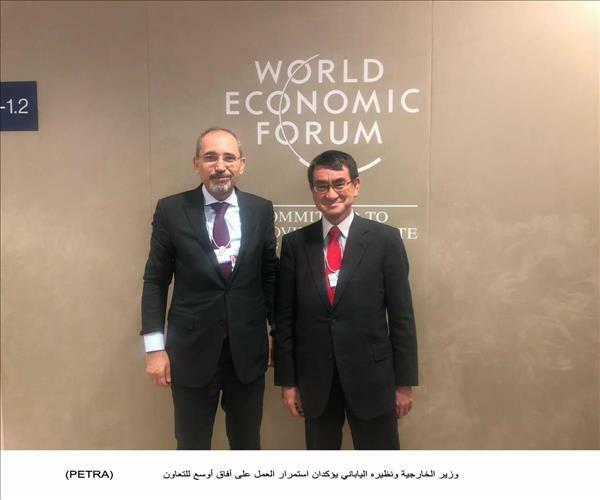 Davos, Jan. 23 (Petra) -- Minister of Foreign and Expatriates Ayman Safadi on Wednesday held talks with Japanese counterpart Taro Kono, during which they discussed ways to further boosting bilateral ties. On the sidelines of the World Economic Forum (WEF) in Davos, Safadi and the Japanese Foreign Minister said the two countries will continue to work on finding a wider scope for cooperation in the economic, investment, defense and security fields. The two ministers also discussed developments in the region and efforts to resolve regional crises and achieve security and stability. Also, the foreign minister met with the UN Under-Secretary-General for Humanitarian Affairs and Emergency Relief Coordinator, Mark Lowcock, for a discussion on the cooperation between the Kingdom and the United Nations in meeting Syrian refugees' needs.